Michelle Obama came to Los Angeles on Thursday to surprise a group of kids at a school near skid row. It's easy to surprise kids. They don't read press releases. 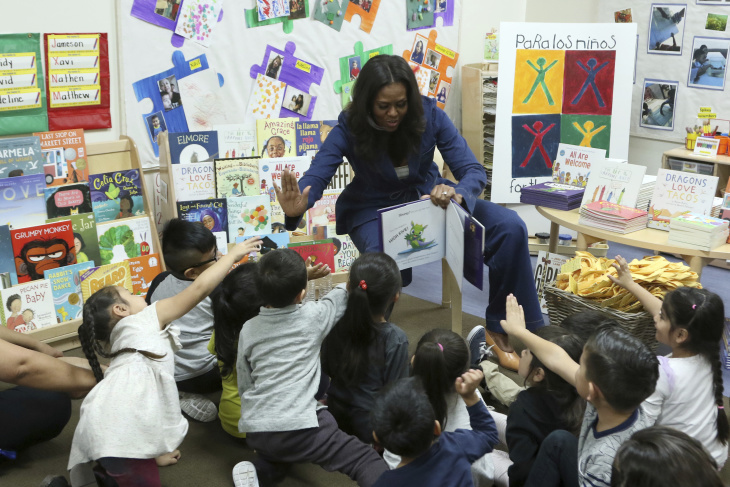 The former First Lady was in Southern California as part of her Becoming book tour, but if you asked the four-year-olds at Para Los Niños Early Education Center, they'd probably tell you she was here to read them The Gruffalo. She was also there in partnership with the Child 360/First Book initiative to emphasize the importance of reading to young children. Site supervisor Nancy Galvez told Neely, "It's a pleasure. We don't get to see people like this often. It was an honor to even shake her hand and give her a hug. It was an honor for me. For the children, we have pictures and in the future, they're gonna go back and say 'Hey she was there when I was going to preschool.'" Angela Capone, V.P. of early education programs at Para Los Niños said, "[The children] know that someone very important took time out of her day to come and read stories to them and she did it in the most wonderful of ways. Clearly she told them that they were the most important people in the room, not her. I think it's something that will make a difference for us for a long while."